If you have followed my blog on some of my other Chinese adventures you will know that I’m not a big fan of Beijing West railway station. Once you have managed to get into the place, the design is based around a number of huge waiting rooms. I don’t think “waiting room” describes it very well though. “Shouting Room”, “Spitting Room” or “Standing Room” would all all be better descriptions in my experience.I showed my ticket to a couple of guards and they concluded between themselves that my best shot was to hang around ticket check no. 4, where my train would board after a delayed train to Xian. At this station where you wait for your train has no bearing on your platform. You might wait in room number 1, go through ticket check no. 4 and then board on platform 9. 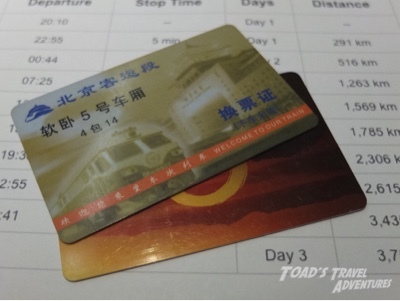 All the announcements are in Chinese and make little sense, so I would advise that you use my “river” technique – get swept towards your intended gate by the crowd for the train departing before yours, and then pull out of the scrum right by the gates pretending you thought it was your train. Once there you shrug your shoulders point at your ticket and have no where to go – but you are then in poll position and have access to a guard on the gate to talk to prior to boarding on your train. This is the Chinese railway equivalent to “Speedy Boarding”.Getting on the train itself is straightforward enough and it’s not long before music plays on the platform and we pull out of Beijing West platform 4, bang on time. For this trip I am in carriage No 5, and one of the best things about it is that is coupled directly with the restaurant car next door. 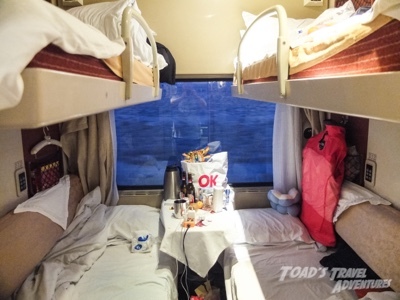 The carriage is “Soft” class, which is made up of eight four berth compartments. It seems mainly full of Chinese couples headed for a short break to Tibet. The atmosphere is actually quite nice, as for now the shouters and the spitters are mostly back in second class hard as far as I can see.At the end of the carriage is a samovar. It’s a fully fitted one, not like the exposed polished boilers that you find on Russian trains. 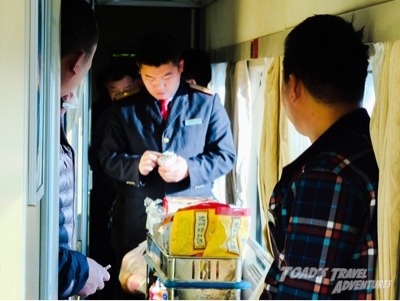 It’s very popular and there is an orderly a queue of passengers (as orderly as it’s possible to have on a Chinese train) waiting to make their instant noodles. In case you are interested, I can report that Chinese instant noodles are considerably more sophisticated than those that can be found in the U.K. Inside the carton there are a series of packets that need to be added in just the right order. Some patience is required, and you can’t just dive in like a student back from the pub on a Friday night. I’m pleased I bothered to bring my Crocs in my daypack, as there is very much a “wet” environment at one end of the carriage. There are three sinks in an open plan bathroom, next to two toilets, one squat, one western. The area is part flooded and seems multi purpose. For some it’s for vegetable preparation, for others it’s for waste disposal. All I want to do is brush my teeth and get far away as quickly as possible. On the subject of luggage, my latest strategy has paid off. 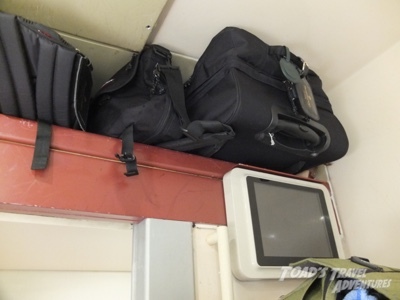 As my big bag is soft sided, it can be squeezed into the roof space which is quite deep in this carriage (not all are like this). The trick is not to have to get anything out of it during the journey, so all the kit I will need access to is already in my daypack. I have been allocated one of the the top bunks in the compartment and I wish I had completed a mountain climbing refresher course before setting out. I clearly don’t yet have the technique required. The first step seems far too low and there is no rope to pull on to get up and onto the bunk. I have developed a technique, but it involves perching on both upper bunks with my knees, like parallel bars. I think this scares a girl called Jenny in the other upper bunk as she is not sure of my intentions. If only I could tell her in Chinese that they are purely honourable, and simply to remain up here without falling into the abyss. Once up in the berth it’s pretty comfy, with a small TV (not working), air conditioning (working), and a place to plug in my own oxygen mask (not yet working). The restaurant carriage is busy. Inside it is a lively mix of off duty police and slightly drunk and shouty passengers. 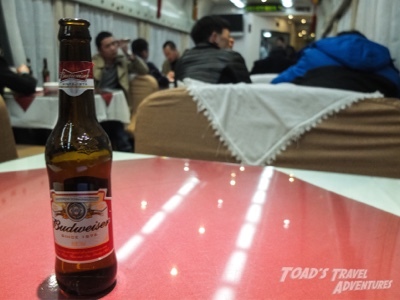 It has beer of sorts – Chinese Budweiser for 10 RMB (£1). The bottles are not cooled though, just out of a cardboard case stacked on the floor at one end of the carriage. This is probably a blessing in disguise, as I should not be drinking – I started taking my diamox this morning and I need to get hydrated. But I have about 30 hours until we start getting up to serious altitude, so allow myself a beer to celebrate having Beijing West behind me. I have been given a special card to prove that I am a legitimate passenger on the train. They take your ticket and give you this instead after you board. Mine is a gold one, so I wave it at the staff in case it’s going to get me into some sort of special lounge, but I haven’t found this yet. Or the executive washroom.Time to turn in for the night and see if I can grab some low altitude rest.